Last Friday I woke up, did my normal early morning dilly-dallying, and was putting the finishing touches on my eye makeup. It was looking like any other Friday, aside from the fact that my toilet hadn't stopped running from my earlier usage. No big deal, I figured, it'll stop by itself and life will be fine. Not so! As I was throwing on my coat and scarf I heard the sound of dripping water coming from my bathroom and went to investigate. Oh, sweet Lord above, my toilet tank was overflowing by the cupful. And to make it even better, I had successfully booby trapped my toilet tank lid by placing a makeup-filled shelf right above it. Just doesn't get better than this, folks. So I gently pulled the shelf aside, careful not to step in the overflow or drop any items on the ground. I didn't know what else to do, so I flushed. And luckily, this worked...for about 30 more seconds until the tank filled up again. So there I was, flushing my toilet and taking 25 second breaks to run around my living looking for my building manager's number. And somehow I even found a couple seconds to run to the kitchen for the mop (I am definitely using this example in my next job interview to demonstrate my multi-tasking abilities). So I finally got through to my building manager and she told me to turn the knob at the back of the toilet. 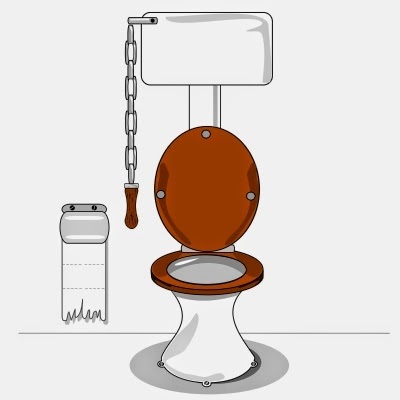 I threw up in my mouth a little at the thought of having to dodge the overflowing water and I tried to figure out how to twist my body just so that I would come in contact with the least amount of plumbing and toilet porcelain as possible. I hopped on the toilet bowl lid, balanced myself on my knees, and reached back to twist that stupid little knob. Just so you know, it feels really uncomfortable to be on the phone with someone you've only met twice and have to say, "Sorry, I have to flush," and to have to say this more than once. I finally got the knob to cooperate and was able to shut off the overflow but that meant that the toilet was no longer in working condition. Right at that moment I realized that I had to pee like crazy. Oh and to make it even better, I was supposed to be at work already. Fortunately, she was able to have a plumber stop by on the same day. I got to go into work embarrassingly late and explain to my boss and co-workers that I had plumbing issues. And to make myself feel better I had to let everyone know that the toilet tank was mysteriously overflowing and that it was not because of a clogged bowl (...you know why). I am a lady, and I do not need anyone thinking I clogged the toilet and had dirty water sloshing around my bathroom. Even now, I know what you're thinking and I didn't clog that toilet. I am a lady! And if I did, I would be man enough to admit it.